Our family is not the church-going kind, so Easter has always been much more about The Bunny and getting together to dye eggs and have dinner all together than the holidays religious symbolism. When time and enthusiasm allows, Easter weekend means a sleepover at my Aunt April’s house, an egg hunt and lots of Easter treats. 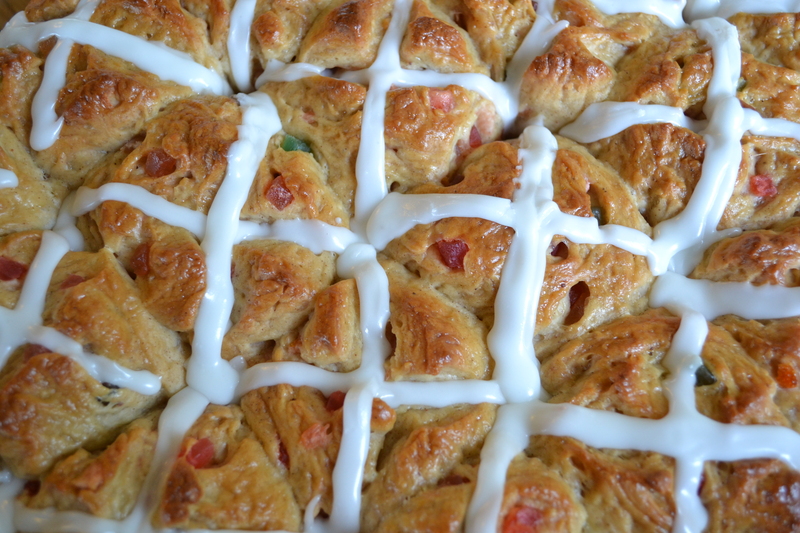 This year, I decided to try my hand at baking some Hot Cross Buns. I tooled around with several online recipes and came up with the one I have put down here. They strike the right chord of yeasted fragrance, sweetness and to the delight of my nieces, Justine and Elizabeth, they are fully raisin-free. For me, despite some tweaks and changes, they are achingly nostalgic and they look, smell and taste like Easter. Hot Cross Buns will forever remind me of my Granny, Fern. I don’t recall her making them, but she always had them in the house around Easter and many a hot cross bun breakfast was had over the years, with cups of hot tea, the sound of the grandmother clock ticking on the wall and the smell of an Easter lily, in full bloom, wafting from the sideboard. Mix thoroughly and brush on unbaked buns immediately before they go into the oven. Just enough milk to make a firm but fluid icing. Mix well and scoop into a zip-top bag. Seal and then trim one corner (to make a piping bag). Pipe icing crosses or Xs on still-warm buns. Warm the milk to just warmer than body temperature, not hot, but definitely warm. 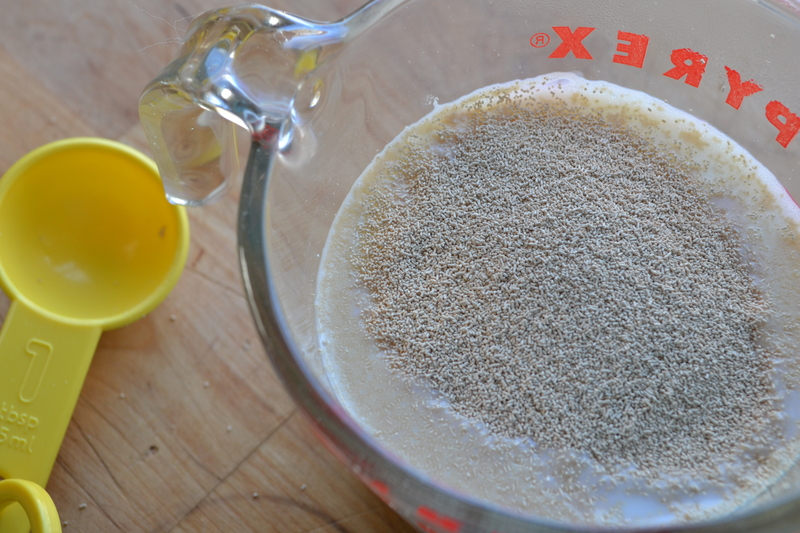 Pour the milk into a large mixing bowl and add the yeast. 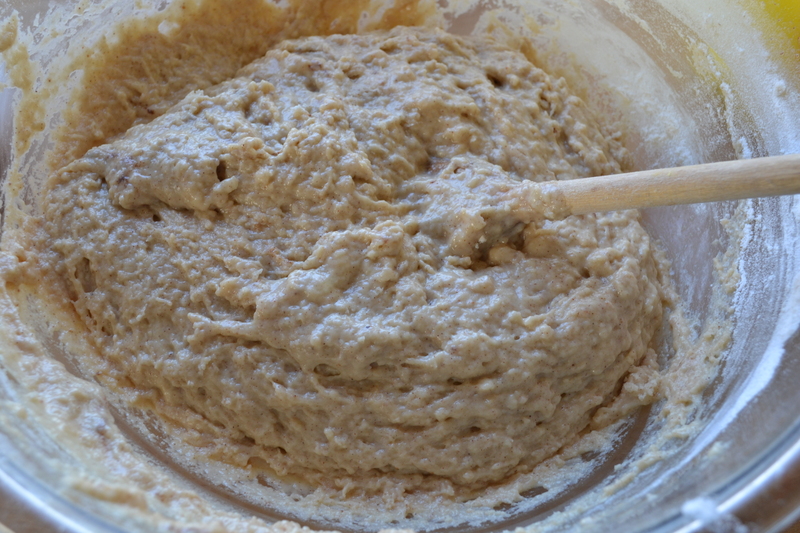 Allow the yeast to dissolve, unstirred for about 2 minutes, then stir or whisk until the yeast and milk are incorporated and look sort of creamy. There may be clay-like bits of yeast in the bottom of the bowl, don’t worry, they will dissolve. Add the sugar, vanilla and almond extract. Melt the butter and allow it to cool slightly before whisking it into the milk mixture. Likewise, beat the 4 eggs and add them slowly, stirring constantly until they are well incorporated. In a separate bowl, sift together the flour, zest and spices. Add the dry ingredients, a cup or so at a time to the wet, incorporating fully before adding more. By the time you get to the 4th cup you may want to switch to kneading with your hands (I wasn’t using a stand mixer because I couldn’t find the dough hook!) 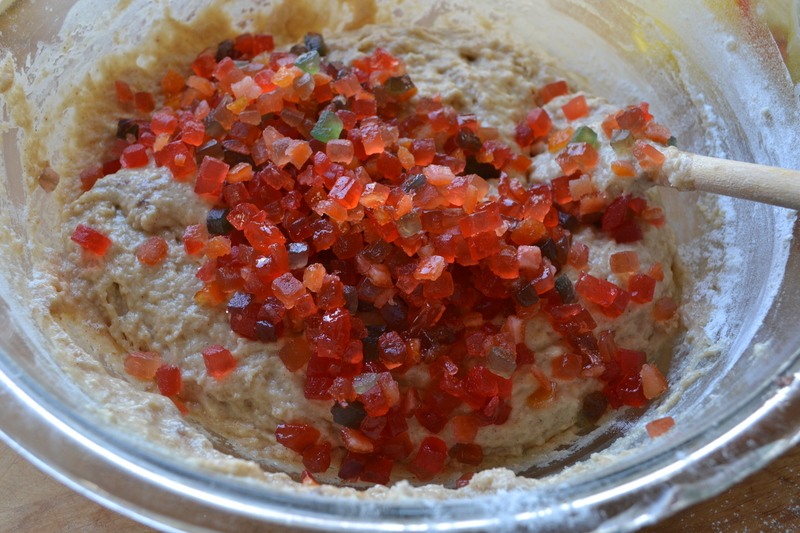 Add the chopped candied peel (or raisins if using them) in and knead until the dough is well mixed. At this point you are not aiming for the smooth, elastic dough you may be envisioning. Right now you just want it well mixed. Transfer the dough ball (it will be sticky) to a greased bowl and cover with a clean tea towel. 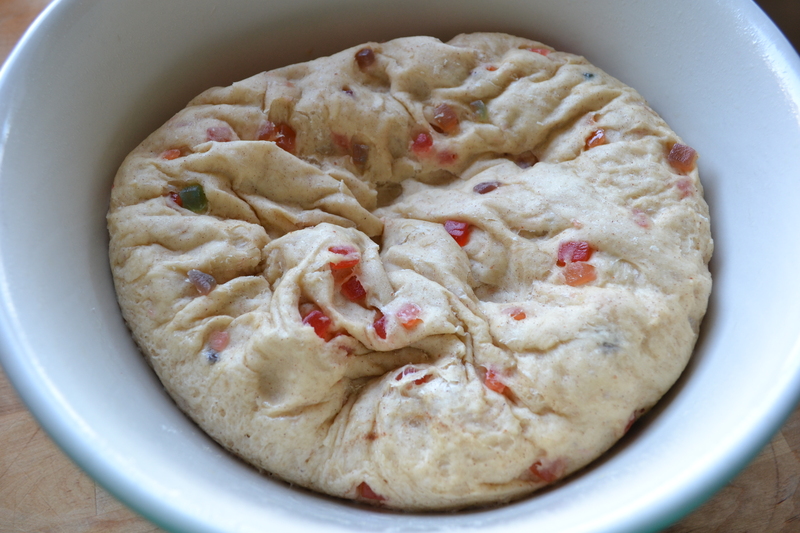 Leave the dough somewhere warm and draught free (in our house that’s on top of the fridge) to rest for an hour. When you come back to it, you’ll see that it has risen ever so slightly. 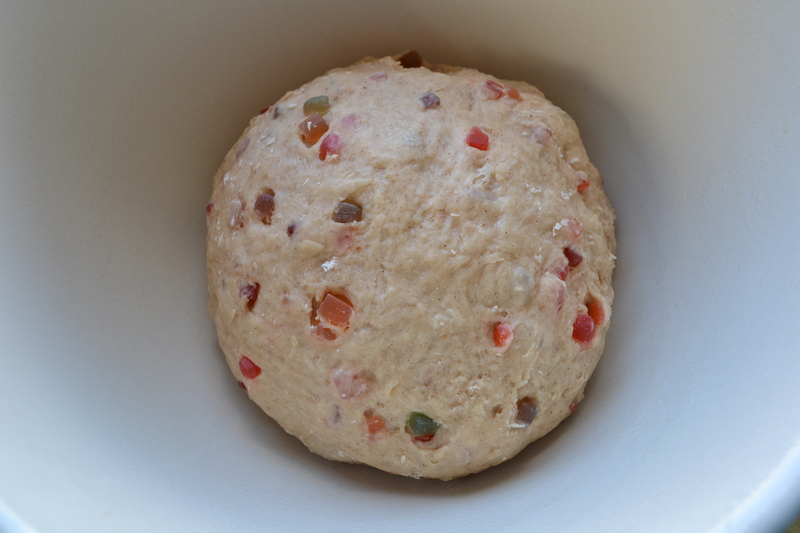 Remove it from the bowl and knead it for 5 minutes. Place back in the same greased bowl and leave it to rise at room temperature for several hours until it is doubled in volume. 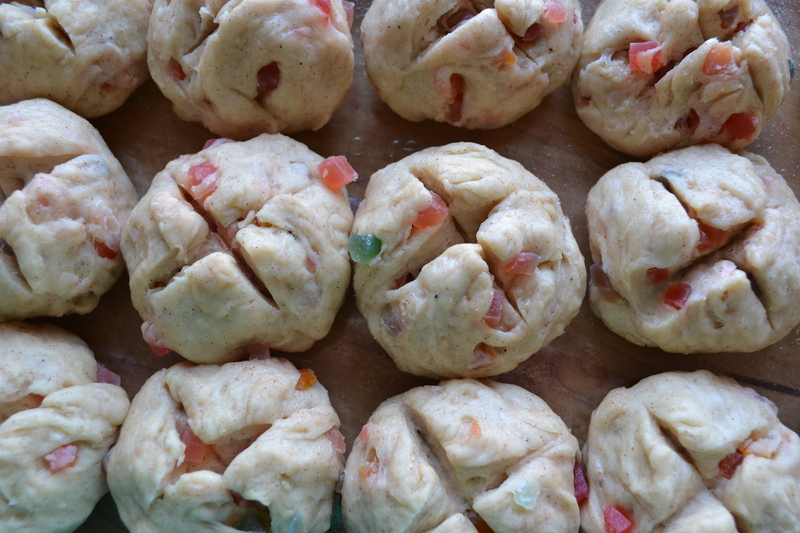 If you are not baking the buns that same day, be sure that the dough is stored in the fridge overnight. Allow 30-45 mins on the counter before you try to form the buns. 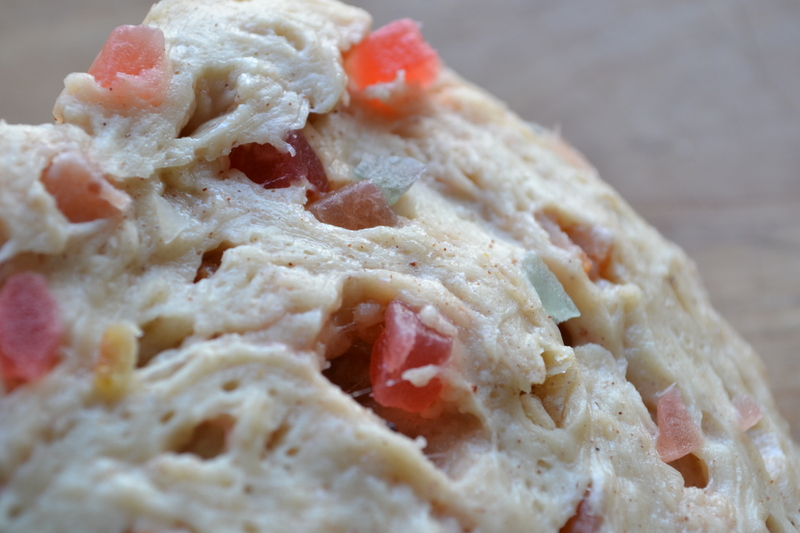 When you are ready to bake, preheat your oven to 375 degrees and punch down the risen dough. Portion it into 24 pieces. Roll each piece into a ball (golf ball sized) and place them in a greased 9″x13″ pan. Allow them to rest and rise for 30 minutes before slashing the cross in the top of them with a sharp knife. Brush on the egg glaze. Bake for 30 minutes at 375 degrees. Once baked, allow the buns to cool, in the pan, for 5 minutes. Pipe on the icing crosses. Serve immediately.